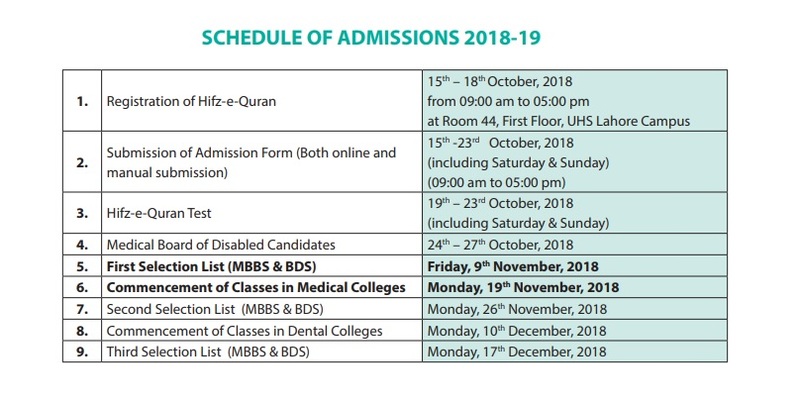 University of Health Sciences (UHS) Lahore has announced MDCAT Schedule 2018 for admission in Medical & Dental colleges in Punjab province. Only those candidates having domicile of any district of the Punjab and Federal Capital Area (Islamabad) who will score the minimum aggregate marks advertised in national newspapers (excluding Hifz-eQuran marks) as per PMDC formula, shall be eligible to apply for admission against Open Merit Seats in public sector medical/dental institutions of the Punjab and Reciprocal Seats in public sector colleges of KPK, Balochistan and AJK. The minimum aggregate percentage of marks required to apply for Session 2018- 2019 is 85%. This condition, however, shall not be applicable to candidates desirous for admission against seats reserved for Under-Developed Districts, Disabled, Cholistan and Children of Overseas Pakistanis/Dual Nationality Holders of Pakistani origin, who can apply if they fulfill basic eligibility criteria. UHS Prospectus to admission in MBBS/BDS in government medical and dental institutions of the punjab.